The largest and most detailed map of Bombay (Mumbai) to appear in the 18th century. A Plan of Bombay-Harbour on th Coast of Malabar. This is a fine example of Laurie and Whittle's 1794 nautical chart or maritime map of Bombay (Mumbai) Island, city, and harbor, India. The map covers from Salsette Island to the continent south to Hunary Island. There is a detailed plan of the city of Bombay as well as several coastal profile views in the upper right quadrant. 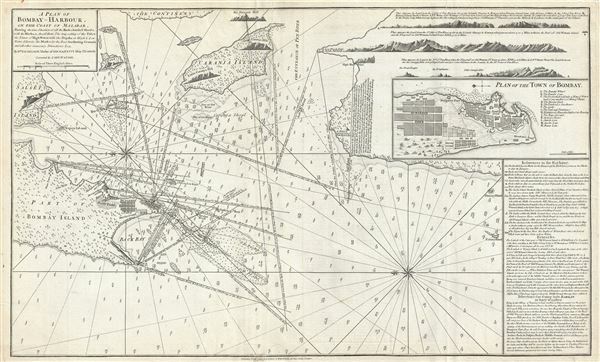 This is arguably the largest and finest nautical chart of Bombay Harbor to appear in the 18th century. The map offers rich detail including countless depth soundings, notes on the sea floor, commentary on reefs, rhumb lines, shoals, place names and a wealth of other practical information for the mariner. Though most charts in the East-India Pilot were derived from earlier maps prepared for Jean-Baptiste d'Apres de Mannevillette's 1745 Neptune Oriental, this particular chart is a new and uniquely British production. The map offers rich detail including countless depth soundings, notes on the sea floor, commentary on reefs, rhumb lines, shoals, place names and a wealth of other practical information for the mariner. Cartographically it was derived from surveys by Captain William Nicholson and Captain Watson. This map was registered by Laurie and Whittle from their offices at 53 Fleet Street, London, on May 12, 1794. Laurie, R., and Whittle, J., The East-India Pilot, or Oriental Navigator, on One Hundred and Eighteen Plates: Containing a Complete Collection of Charts and Plans, &c., &c. for the Navigation not only of the Indian and China Seas, but of those also between England and the Cape of Good-Hope; Improved and Chiefly Composed from the Last Work of M. D'Apres de Mannevillette; with Considerable Additions, from Private Manuscripts of the Dutch, and from Draughts and Actual Surveys Communicated By Officers of the East-India Company A New Edition, Containing One Hundred and Five Charts. (London: Laurie and Whittle) 1794. Very good. Minor wear and verso repairs along original fold lines. Some minor margin tears. National Library of Australia, 3666030.